JFace Data binding. This tutorial explains Eclipse JFace Data Binding which can be used to synchronize data between different objects. This tutorial is based on Eclipse 4.6. The JFace data binding framework allows to synchronize changes in properties of objects. Validation and conversion during the synchronization process is supported. For example you could bind the String property called firstName of a Java object to a text property of the SWT Text widget. If the user changes the text in the user interface, the corresponding property in the Java object is updated. To observe changes in an attribute of a Java object, a data binding framework needs to be able to register itself as a listener to this attribute. JFace data binding provides API to register to changes in SWT widgets and JFace UI elements. Other Java object must implement this support. For example you can implement PropertyChangeSupport according to the Java Bean specification in these Java elements. Or you can use the WritableValue interface from JFace inside the model. The IObservableValue interface is the basis for observing properties in JFace. The Properties API provides factories to create IObservableValue objects. The main factories are to created instances of IObservableValue are listed in the following table. Used to create IObservableValue for Java objects. The term Pojo (Plain old Java object) is used to describe a Java object which does not implement a specific framework API. Used for Java Beans. A Java Bean is a Java object which follows the Java Bean specification. This specification requires that the class implements getter and setter methods for all its attributes. It must also implement property change support via the PropertyChangeSupport class and propagate changes to registered listeners. Used for properties of SWT widgets. Used for properties of JFace Viewer. Used for properties of non specialized types, like Objects, Collections or Maps. Used for properties of special Objects, Collections, Maps and Entries of an IObservableMap. The following code demonstrates how to create an IObservableValue object for the firstName property of a Java object called person. The next example demonstrates how to create an IObservableValue for the text property of an SWT Text widget called firstNameText. The following plug-ins are required to use JFace Data Binding. In Eclipse 4.6 the data binding framework has been partially generified. This work is planned to be finished in a later release. Currently you need to use @SuppressWarnings("unchecked") sometimes in your data binding code to avoid compiler warnings. A Java class which provides PropertyChangeSupport looks like the following example. Other domain classes could extend this class. The following example demonstrates that. If you are able to use JFace API in your domain model, you can use WritableValue to provide the option to track values. *            The summary to set. *            The last name to set. If you connect two properties and one of these properties cannot be observed, you you can still use data binding for a uni-directional binding. For example, you can connect the text property of a SWT Text field to the summary field of a Todo object, even if Todo cannot be observed. In this case, updates in the summary of the Todo object will not update the Text widget. But relevant change in the Text widget user interface will update the Todo property. Eclipse 4.6 introduced the ISideEffect databinding API. It allows you to run code whenever one or more observables changes. An ISideEffect is a lot like a listener except that it doesn’t need to be attached to anything. Instead, it reacts automatically to changes in the tracked properties. 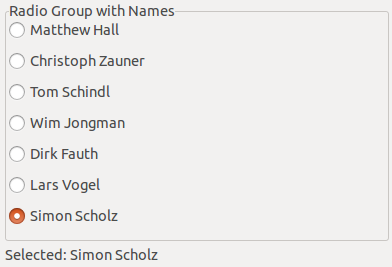 For example, the following code updates the label with the value of the user name every time the user name changes. ISideEffects can react to changes in multiple observables, and will avoid performing excessive updates, if the observables fire many change events in a short period of time. You can use the ISideEffectFactory to create several ISideEffect instances that share the same life cycle. For example, all ISideEffect instances that are created by the ISideEffectFactory obtained from the WidgetSideEffects#createFactory(Widget disposableWidget) method are automatically disposed once the corresponding widget is disposed. The DataBindingContext class provides the functionality to connect IObservableValue objects. Via the DataBindingContext.bindValue() method two IObservableValue objects are connected. The first parameter is the target and the second is the model. During the initial binding the value from the model is copied to the target. The initial copying from model to target is useful for the initial synchronization. For example, if you have an attribute of a Person p object and the text attribute of a Text txtName widget, you typically want to copy the value from p to txtName at the beginning. You can also observe nested model properties, e.g., attributes of classes which are contained in another class. The following code demonstrates how to access the country property in the address field of the object person. You can also observe entries of a map via an IObservableMap with the Observables.observeMapEntry() method. This allows you to control the point in time when you want to update or use the values from the map. Policy constant denoting that the source observable’s state should not be tracked and that the destination observable’s value should never be updated. Policy constant denoting that the source observable’s state should not be tracked, but that validation, conversion and updating the destination observable’s value should be performed when explicitly requested. You can call DataBindingContext.updateModels() or DataBindingContext.updateTargets() to update all bindings at once. Or you can call Binding.updateTargetToModel() or Binding.updateModelToTarget() to update a single binding. Policy constant denoting that the source observable’s state should be tracked, including Validate changes except for validateBeforeSet(Object), but that the destination observable’s value should only be updated on request. Policy constant denoting that the source observable’s state should be tracked, and that validation, conversion and updating the destination observable’s value should be performed automatically on every change of the source observable value. If no UpdateValueStrategy is specified, the UpdateValueStrategy.POLICY_UPDATE is used by default. You can register converters and validators in the UpdateValueStrategy object. Converters allow to convert the values between the observed properties. Converters are defined based on the IConverter interface. UpdateValueStrategy.setConverter() allows to set the converter. The IConverter.create(Object, Object, Function) allows to create a converter using a lambda expression. The static UpdateValueStrategy.create(IConverter) method allows to create an update strategy with a converter. For example, you can convert a String to another object and vice versa. For example, assume you have a Person object with a programmingSkills property. The entries of programmingSkills should be shown in the Text widget as text separated by comma. Therefore a conversion is necessary. In order to apply these converters an UpdateValueStrategy for the binding needs to be defined and applied. A validator allows you to implement validation of the data before it is propagated to the other connected property. A class which wants to provide this functionality must implement the org.eclipse.core.databinding.validation.IValidator interface. The WizardPageSupport class allows to connect the result from the a data binding context to the given wizard page. This updates the wizard page’s completion state and its error message. JFace Data Binding allows you to use icon decorators in the user interface which reflect the status of the field validation. This allows you to provide immediate feedback to the user. For the creation of the control decoration you use the return object from the bindvalue() method of DataBindingContext object. The result might look like the following screenshot. When using radio buttons each button usually represents a certain value. In order to bind the value according to the selected state in a radio button group, the SelectObservableValue class is the right choice. The following example shows how to bind the currently selected radio value to a Label. You can register a listener to all bindings of the DataBindingContext class. Your listener will be called when something has changed. For example this can be used to determine the status of a part which behaves like an editor. If its data model changes, this editor marks itself as dirty. You can create bindings to a WritableValue object. A WritableValue object can hold a reference to another object. You can exchange this reference in WritableValue and the databinding will use the new (reference) object for its binding. This way you can create the binding once and still exchange the object which is bound by databinding. To bind to a WritableValue you use the observeDetail() method, to inform the framework that you would like to observe the contained object. A ComputedValue provides an abstract calculate method, which is able to compute a value from observable trackers, which are referenced in it’s calculate method. Since Eclipse Neon a new create method has been introduced, which accepts a Supplier that contains the actual implementation of the calculate method. So there’s no need any more to derive from ComputedValue. So basically ComputedValue can easily combine different observables and is recomputed every time one of the tracked getter are touched. A really popular example of a ComputedValue implementation is the AggregateValidationStatus, which keeps track of all validation statuses, which have been passed to it and aggregates them to one MultiStatus or just returns the one with maximum severity. It is also a great alternative to converter implementations. For instance the previously described AggregateValidationStatus returns an IStatus as value, but if this should be bound to the enable state of a Finish button, having a boolean value would be necessary. Applying an IConverter to convert from IStatus to boolean would be far more overhead. JFace data binding provides functionality to bind the data of JFace viewers. Data binding for these viewers distinguish between changes in the collection and changes in the individual object. In the case that data binding observes a collection, it requires a content provider which notifies the viewer, once the data in the collection changes. The ObservableListContentProvider class is a content provider which requires a list implementing the IObservableList interface. The Properties class allows you to wrap another list with its selfList() method into an IObservableList. You can also use the ObservableMapLabelProvider class to observe changes of the list elements. ViewerSupport simplifies the setup for JFace viewers in cases where selected columns should be displayed. It registers changes listeners on the collection as well as on the individual elements. ViewerSupport creates via the bind() method the LabelProvider and ContentProvider for a viewer automatically. The ViewerProperties class allows you to create IObservableValue for properties of the viewer. For example you can track the current selection, e.g., which data object is currently selected. This binding is called Master Detail binding as you track the selection of a master. To access fields in the selection you can use the PojoProperties or the BeanProperties class. Both provide the value().observeDetail() method chain, which allows you to observe a detailed value of an IObservableValue object. For example the following will map the summary property of the Todo domain object to a Label based on the selection of a ComboViewer. You can chain properties together to simplify observing nested properties. The following examples demonstrate this usage. Sometimes the observables, which are provided by the factories (see [databinding_observable_factories] ), are not sufficient and you might want to create a custom IObservable. This implementation can extend the AbstractObservable class or one of it’s subclasses, like the AbstractObservableValue class. For example the following custom widget allows to set a text. Since there is no predefined IObservable for custom widgets, you have to implement a custom one. While is is possible to use PojoProperties class to create an IObservableValue by using PojoProperties.value("text").observe(customWidget) this would not result in an ISWTObservableValue. Only by using an ISWTObservable classes like ControlDecorationSupport would work, because only those offer a public Widget getWidget(); method, so that the widget may be decorated. The CustomWidgetObservableValue extends AbstractObservableValue and also implements the ISWTObservableValue interface. A better approach is to implement the IProperty interface, like IValueProperty, IWidgetValueProperty and others. So let’s implement the solution of the previous section with an IProperty implementation. Delegating properties act a bit like a factory for IProperty objects, where the IProperty is not created directly, but at the moment, when the observe method is called. For instance a DelegatingValueProperty creates a IValueProperty according to the object, which should be observed. So you can decision, which IValueProperty is used, is made at the moment, when the observe method is actually called. Imagine, we want such a factory for the IValueProperty classes we created in the former sections. Therefore we can derive from DelegatingValueProperty. In order to have a factory like the WidgetProperties class, we could create a VogellaProperties class. You might want to have a look at the WidgetProperties, which contains several methods with more sense for those delegates. Here is the code how to use the factory for "vogella" properties and some samples, which fit to the intention of the delegates. With Java 8, you have a redesigned Data and Time API. JFace data binding does currently not support not based on Java 8 therefore this Java 8 API cannot be used out of the box with JFace data binding. To use it, you have to implement your custom WidgetValueProperty. // LocalDate, LocalTime and LocalDateTime. // ... otherwise set year, month and day. Here we implement a binding between the DateTime SWT widget and a TemporalAccessor, which for instance can be a java.time.LocalDate or java.time.LocalTime. The usage of the DateTimeSelectionProperty is demonstrated by the following listing. In this sample we bind the DateTime widget to a WritableValue, which contains a TemporalAccessor instance and this WritableValue is changed by selecting a date in the TableViewer. The dateTimeObservableValue is also bound to a label, in order to see the changes by manually manipulating to the DateTime widget. If you select a date in the TableViewer, this updates the WritableValue and therefore also the DateTime widget and also the Label, because all these are bound together. This article assumes what you have basic understanding of development for the Eclipse platform. Please see Eclipse RCP Tutorial or Eclipse Plugin Tutorial. For the databinding with JFace Viewers you should already be familiar with the concept of JFace Viewers. For an introduction on JFace Viewers please see JFace Overview, JFace Tables and JFace Trees. Create a new Eclipse RCP project "de.vogella.databinding.example" using the template "RCP application with a View". Create the de.vogella.databinding.person.model package and the following model classes. Add the JFace Data Binding plug-ins as dependency to your plug-in. Change the View class to the following. Run the example and test it. Each time you change the UI element the model changes automatically. If you change the model then the UI will also update. If you try to input something else than a number in the age field you will get an error symbol in the UI and if the mouse hovers over the symbol you see the error message. The following extends the example with the usage of Validators and Decorators. 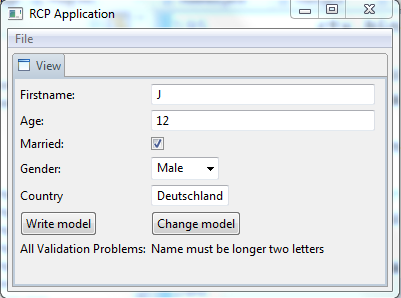 In this example the Validators ensures that the firstName has at least 2 characters. A new label displays the validation status via a Decorator. Create the following StringLongerThenTwo class. The following shows the new code for View.java. Create a new View in your "de.vogella.databinding.example" plug-in with the following class. Via the buttons you can change the details of the WritableObject. Create a new Eclipse RCP project "de.vogella.databinding.viewer" using the "RCP Application with a view" template. Add the databinding plug-ins as dependency to your plug-in project. Create the de.vogella.databinding.viewer.model package and re-create the Person and Address class from the previous example in this script in this package. Create the following MyModel class to get some example data. Create a new view called ViewTable add it to your RCP application. Change ViewTable.java to the following. In this example the user interface is updated if you delete and element or add an element to the collection. Run this example and test it. If you use WritableList and ObservableListContentProvider you only listens to the changes in the list. You can use ObservableMapLabelProvider to listen to changes of the individual objects. Change the View.java to the following.